Thanks for all the good wishes this last week. The back is feeling much better, though I am still babying it a tad. That "swoosh" you heard was Nancy arriving home about 9:30pm on Friday evening and then leaving again at 1:00pm Monday. Just shy of 40 hours. Now I await her return in 13 days. Bad news indeed. Good news is she is doing very well as she manages the open-enrollments for these nursing homes. Nice thing is, for the next two weeks she is staying in the pool house of the in-laws of the salesperson she is partnering alongside. This means no hotel expense for those 13 days. Have to tell you, I am exhausted today. Of course lying on my back for 4-5 days and then spending the last 40 hours helping Nancy to get ready to leave again has left me drained of energy. I need to get it all back again...which I know I will. Tonight on MUSIC ON THE COUCH I am featuring two Beale Street staples here in Memphis. 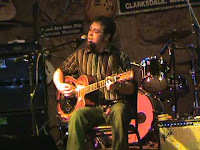 Chad Nordhoff I have mentioned seeing him one evening on Beale where he played for over 3 hours without stopping. This was not an unusual evening I have learned. It is just how Chad plays. Well, with the release of his new album "Good Work If You Can Get It", we are bringing Chad to The Couch to allow you to hear his story and music. Also on tap is Eric Hughes who has been sharing his talents on Beale since 2001. 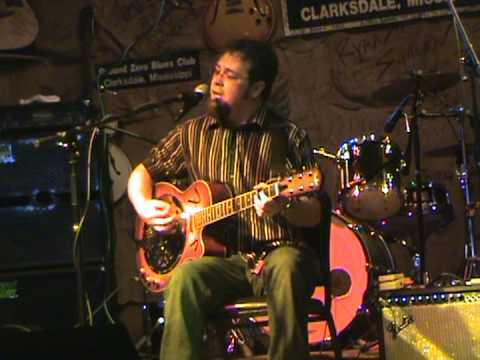 He is also the founder and past-president of the Memphis Blues Society. I will share music form all three of Eric's albums and explore the Memphis Blues scene with a veteran. All at 9:00pm Central time this evening on MUSIC ON THE COUCH. Hope to see y'all there. Of course with not being able to do much this last week, I am behind on my 'gotta-dos' around here. I figure next weekend will be busy busy. I have some more old video tapes to review to see what is on them, then on to completing the DVDs of Matt's childhood-teenage years. I am also behind on organizing all my photos and there is still plenty of music to digitize. I have also promised a list of questions to a gentleman who is a very good writer and musician. He is not able to appear on Music On The Couch due to health issues, so I promised I would do the interview the old fashioned way. That was a number of weeks ago, but with everything happening, I put it far back on my list. Not fair to this gentleman, so I will be coming up with intelligent interesting questions to send this week. Glad to hear that you're back is back to feeling better; I was actually thinking about you the other day when mine was starting to give me a few warning signs of "Hey, watch it, I may put a major crimp in your plans here pretty soon!" Thankfully it seems to have knocked that stuff off without actually putting me down for the count but I know I'm past due so am trying to walk on eggshells a little bit. It sounds like your Nancy is one very, very busy lady but I bet she's very good at what she does and that's what keeps her so busy. And what is that they say about absence making the heart grow fonder? Sorry your time with your beloved is limited these days. Hope your days are swift until her return. Glad your feeling better. The back is nothing to monkey with! The gentleman you mentioned is happy indeed for the mention and looks forward to receiving the list of questions. I have been telling him of your back problem. I myself have been wearing a back brace for a couple weeks. I just cannot get past the spasms in my back completely. Hope you don't have the back problem as long. Take care. Little steps...don't re-tweak that back. Uh, you DID watch "Man Men" last night, didn't you? Glad the back is getting better. Mad Men was brilliant last night, but watched it on TiVo, so was not available to watch live with you. Um yeah, and I totally look like a dumbass. Glad to hear you're feeling better. I believe I have had the pleasure of hearing both of tonight's guests on at least one occasion on Beale Street. Glad your feeling better Vinny. Dang, seems like once a year you go out on us like that. You really should consider finding out exactly what it is and your options to repair it. Am I telling you what you should do? No, I'm typing it. Sorry to hear about your back, but glad that you're on the mend. Hopefully Nancy will be back in your arms soon, and for good (or at least not as long away at times)! As you know, I'm here. I'm alive. And I'm swamped already. Tomorrow is a down day, so rest for me and possibly some blogging. I know; don't faint.